Sleep disorders are common in children and include both respiratory and non-respiratory causes. An awareness of these conditions is important due to the recognized complications of untreated sleep disorders in childhood. This review provides an overview of common sleep disorders in childhood including an overview of treatment options. 40 Gillett E, Perez IA. 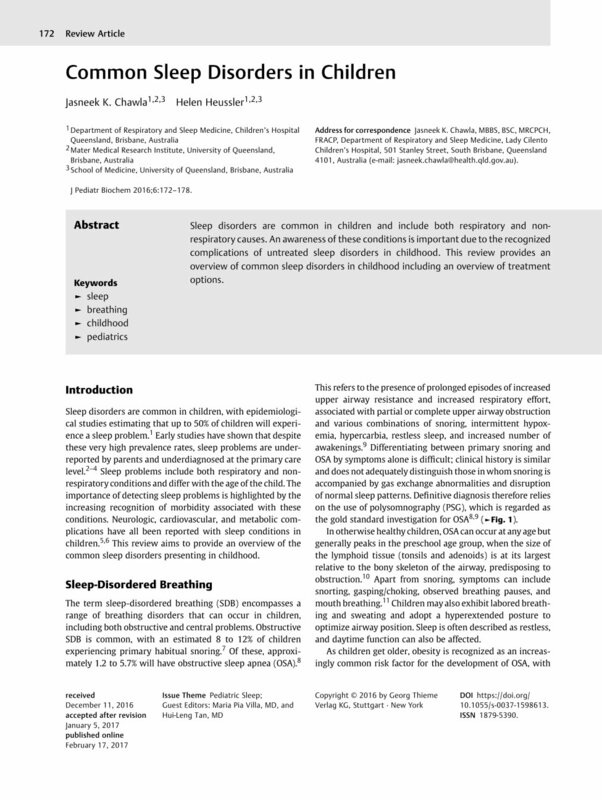 Disorders of sleep and ventilatory control in Prader-Willi syndrome. Diseases 2016; 4 (3) 23 DOI: 10.3390/diseases4030023. 52 Rodriguez AV, Funk CM, Vyazovskiy VV, Nir Y, Tononi G, Cirelli C. Why does sleep slow-wave activity increase after extended wake? Assessing the effects of increased cortical firing during wake and sleep. Front Hum Neurosci 2016; 10: 456 DOI: 10.1523/JNEUROSCI.1614-16.2016.